Manila: Less than two weeks after monsoon rains inundated large parts of Metro Manila and nearby regions, a new storm hit the northern Philippines, bringing heavy rains that triggered landslides and floods, the government said on Monday. The storm, which was expected to intensify into a typhoon, remained almost stationary off the northern tip of the main Philippine island of Luzon, battering the mountainous region with powerful downpours. The storm caused landslides, damaging eight major highways, the National Disaster Risk Reduction and Management Council said in a statement. There were no immediate reports of casualties. Tropical storm Igme’s (international code name Tembin), packing maximum winds of 105 kilometres per hour with gusts of up to 135 kph, was expected to remain off the northern tip of Luzon for more than a day, the council added. Local communities were warned to monitor the levels of rivers and streams in their area and prepare for evacuations in case they begin to rise. The storm was forecast to move west slowly according to the Philippine Atmospheric Geophysical and Astronomical Services Adminisgtration (Pagasa). “Winds of 30 to 60 km/h are also expected in the next 36 hours in Isabela and Cagayan, which are now under public storm warning signal,” the weather bureau said. Fishing boats and other small seacraft have been advised against venturing out into the eastern seaboards of Central and Southern Luzon due to Igme and the surge of the southwest monsoon,” Pagasa said. Igme’s arrival in the Philippines came just days after tropical storm Helen delivered heavy rainfall over Northern Philippines, particularly La Union province, as well as Pangasinan in Central Luzon. Helen made its presence felt in northern Philippines last August 15, affecting some 13,200 people in five regions of the country. According to the National Disaster Risk Reduction and Management Council (NDRRMC) a total of 15 cities and municipalities suffered flooding as a result of rains brought in by Helen. Helen likewise claimed the lives of ten people and injured 17 others. The storm also caused 125 million pesos in damages in agriculture and fisheries. 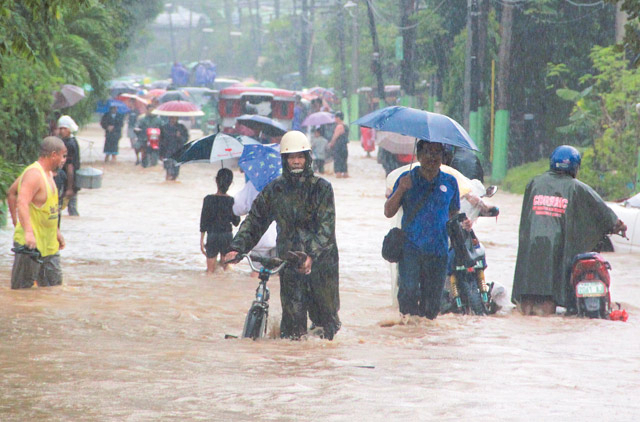 Two weeks ago, southwest monsoons enhanced by the presence of typhoon Haikui brought heavy rains that caused widespread flooding in Metro Manila and surrounding provinces. The weather disturbance killed some 109 people in the National Capital Region and other parts of the country. A total of 12,962 houses were damaged in five regions. The total cost of damages to agriculture has been pegged at more than 3 billion pesos (Dh260 million) and 651 million pesos (Dh56 million ) in infrastructure. The devastation brought about by the monsoons had been likened to that dealt by typhoon Ketsana, which visited the country in September 2009.